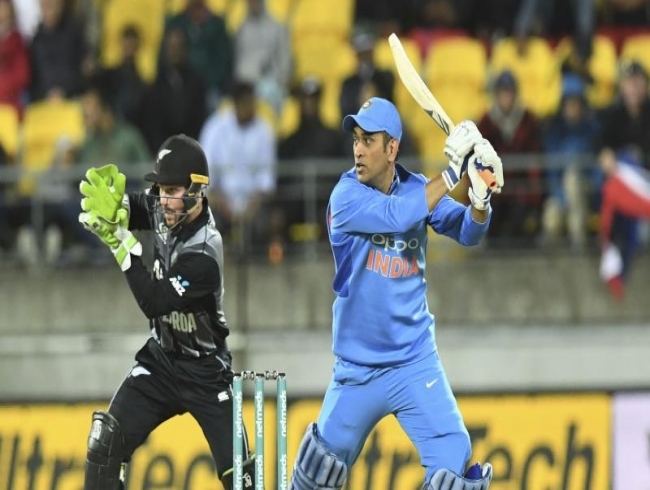 Wellington: After scoring three consecutive fifties during India’s ODI series against Australia in January, MS Dhoni achieved a forgettable feat in the first T20I against New Zealand here on Wednesday. The 37-year-old wicketkeeper-batsman top-scored for the visitors following a knock of 39 runs from 31 balls, but ended up on the losing side. However, this is nothing new for the Jharkhand batsman. This was the fifth time he top-scored in a T20I on a losing occasion, and the first since 2017 when India lost to England in Kanpur while he scored 36 runs. In fact, the former skipper had played an unbeaten 48 back in 2012 in a T20I against Australia in Sydney, which India eventually went onto lose. The visitors’ 80-run defeat to the Kiwis was also the heaviest in T20Is in terms of batting second. Chasing a mammoth total of 220, almost half of the Indian side collapsed for single figures. Meanwhile, only Shikhar Dhawan (29), Vijay Shankar (27) and Krunal Pandya (20) were better performers with the bat apart from Dhoni. The second T20I will be played in Auckland on Friday.